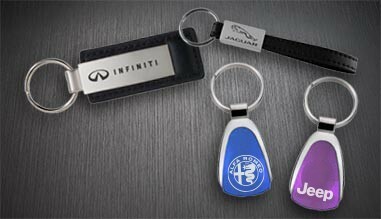 Rev up your customers’ excitement and simultaneously increase brand awareness with promotional imprinted auto products from Sutter’s Mill Specialties. 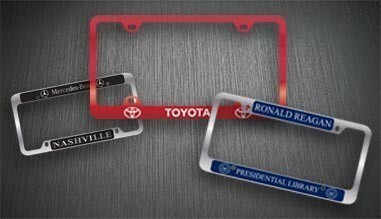 Increase the value of your vehicles with personalized, elegant chrome license plate frames, tire and hitch covers, and ad plates. Ready for a test drive? Give your customers a hands-on experience with your brand and business with a custom-branded, expertly crafted key chain. Our wide assortment of elegant, stylish key chains features options such as wine openers, carabiners, and crystal-accented purses to ensure you make a bold, personal statement that reflects your customers’ interests. Go with a tried-and-true, personalized promotional item. No matter the client or situation, Sutter’s Mill Specialties has the custom-branded, laser-engraved key chains you want. From bottle opener key chains to elegant leather and metal combination key chains, all with sturdy metal key rings, you’ll find just the one you need right here. 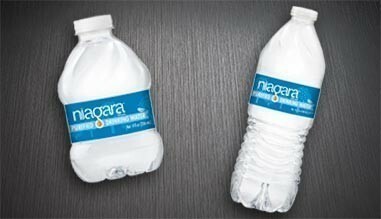 You’ll show clients you’re willing to go the extra mile when you provide them with cold, pure bottled water. Sutter’s Mill Specialties has you covered with multiple hydration options – choose fresh spring water in 8 or 16 ounce recyclable bottles – or make it an unbeatable promotional item with custom-branded labels, so every water bottle you provide will proudly feature your company and logo. Get creative with your vehicle advertising with these eye-catching, branded automotive products from Sutter’s Mill Specialties. 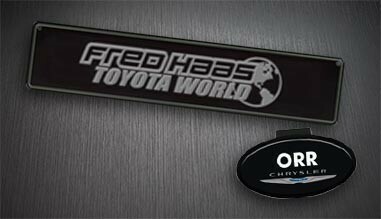 We have customized trailer hitch covers, spare tire covers, and embossed advertisement license plates – in both standard and European styles – that will ensure your company is always drawing attention out on the road.